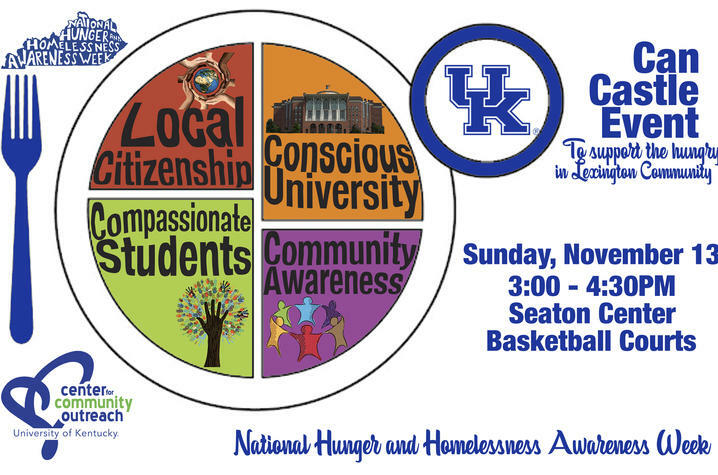 LEXINGTON, Ky. (Nov. 9, 2016) —The week of Nov. 13 – 18 is a time for the University of Kentucky family to come together with the Lexington community and make a positive impact locally by participating in National Hunger and Homelessness Awareness Week (NHHAW). National Hunger and Homelessness Awareness Week is held the week before Thanksgiving each year. It is a time to be thankful, while also a time to share compassion with your neighbors who are experiencing homelessness. This week is a chance to help solve the problem of Hunger and Homelessness, so that no one has to experience it, especially during the holiday season. For more information on this movement, visit the National Coalition for the Homeless website. Thanksgiving is a holiday spent surrounded by people you are thankful for, and many are fortunate enough to have food on the table. UK's Center for Community Outreach (CCO) organizes NHHAW to get students at the University of Kentucky and the greater Lexington community involved by promoting active citizenship and experiential education activities. This week provides an opportunity to collect food, serve homeless shelters and to build awareness of the social and economic conditions that promote poverty globally and locally. Beginning Monday, Nov. 14 and ending at 5 p.m. Friday, Nov. 18, donations will be collected for the annual Thanksgiving Basket Drive. These will be donated to students and their families in the Fayette County Public School System and to residents in the Hope Center's Housing First program. A list of foods accepted can be found here. Any extra donations of gift cards or toiletries are also appreciated. Sunday, Nov. 13: The CCO will host a Can Castle contest. As part of the Thanksgiving Basket Drive, student organizations, residence halls and individuals will compete to see who can raise the most canned goods — and build the coolest castle! This will take place at the Seaton Center at 3 p.m.
Monday, Nov. 14: The CCO will share a meal with the residents at Arbor Youth Services (AYS), a home in Lexington for homeless youth. The meal will be provided by the Campus Kitchen and participants will dine in Room 536, W. Third St. at 6:30 p.m. They will share stories with the children from AYS. Contact nhhaw@ukcco.org for information about transportation to the event. 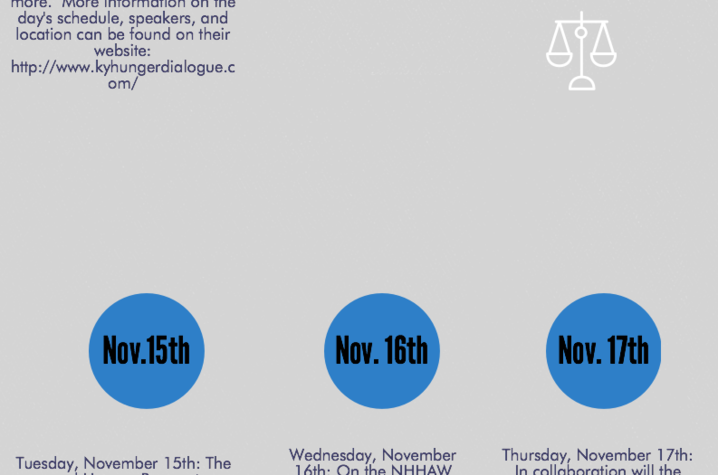 Tuesday, Nov. 15: The annual Hunger Banquet, a simulation of global hunger designed by Oxfam International, will be at 6 p.m. in Woodward Hall, Room 307 of the Gatton College of Business and Economics Building. Join the CCO for dinner and a valuable experience and discussion. Wednesday, Nov. 16: On the NHHAW Day of Service, UK students will have the opportunity to volunteer for two-hour time shifts at a variety of local nonprofits that are engaging daily in the fight to end hunger and homelessness. The day will begin at 8 a.m. and run until 8 p.m., allowing volunteers to meet the needs of Lexington community partners and have a wide range of scheduling availability for students' busy schedules. There will also be an opportunity for students to hear from Lexington's director of Homelessness Intervention and Prevention at The Gathering: Engaging the Issues, where students will be encouraged to think critically and practically about the needs in the community and beyond. Student groups ranging from five to 25 will be serving with the following community partners: Lexington Rescue Mission, New Life Day Center, God's Pantry, Salvation Army, Arbor Youth Services, Community Action Council, Seedleaf, HOPE Center, and The Lighthouse Ministries. Thursday, Nov. 17: In collaboration will the Student Activities Board, the CCO will host a panel on homelessness called #TrendingTopics: Homelessness, featuring two speakers from the National Coalition for the Homeless's Faces of Homelessness Speaker's Bureau, Steve Thomas and Candi Darley, and the director of a nonprofit serving Los Angeles' homeless, John Maceri. The event will be held in the Kincaid Auditorium of the Gatton Building at 7 p.m.
Partners for this year's NHHAW who have helped make the week possible are the Campus Kitchen at UK, Delta Sigma Theta, SSTOP Hunger and the Student Activities Board. NHHAW is an initiative housed in the UK Center for Community Outreach. The CCO seeks to serve, connect and unite the University of Kentucky with the surrounding community in collaborative efforts to promote lifelong community service. For more information about the CCO, visit www.ukcco.org.